Buena Vida Townhomes is a soundside community located directly across the street from Navarre Beach. It is approximately 300 yards from the white sandy beach and crystal clear emerald green water of the Gulf of Mexico. This townhome is a perfectly affordable location for families on a budget. You can enjoy a bike ride along the beach and afterwards take a brisk walk to the local restaurants. Each two story unit offers a fully equipped kitchen, comfortable furnishings, and a washer/dryer. 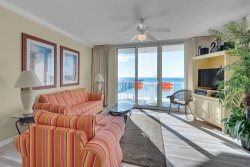 The complex features a private swimming pool, boat slip, and a private fishing pier on the Santa Rosa Sound for guests to enjoy.